Natalie B Coleman launched her first collection in 2011 and has since grown from strength to strength. Every season Natalie amuses with her tongue in cheek titled collections but when it comes down to clothes, it’s a serious business. Fabulous, high end fabrics finished to perfection with interesting prints, great detail and flattering draping have become her staples. Launching your own brand is not an easy task though and Natalie recently started to work with Microsoft to make her working life that bit easier. 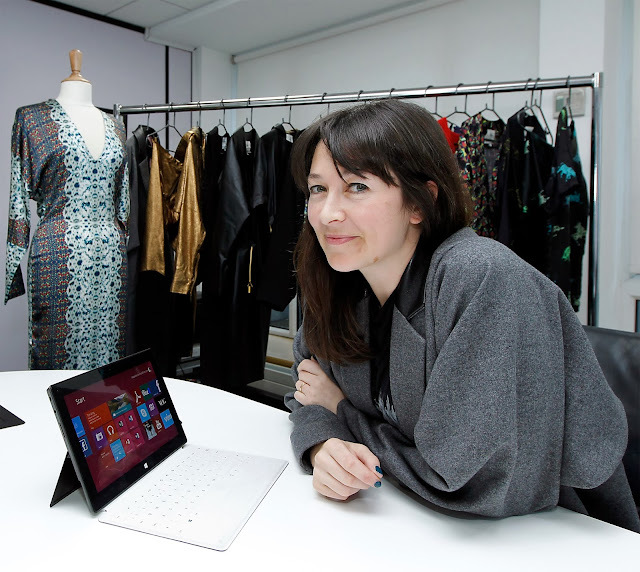 As a Microsoft ambassador, Natalie’s passion for style and design has been enriched through the apps and services she has discovered; such as having her favorite fashion sites pinned to her Start screen and the 'Fashion’ app which allows her to follow the feed of all her favorite bloggers. I had an opportunity to chat to Natalie about everything from the AW’13 collection, through her favorite food to stories from video sets. I hope you enjoy discovering a bit more about Natalie as much as I did. Natalie B Coleman collections are inspired by women and their stories, who inspired your AW’13 collection? I think it wasn’t a specific person, each collection is almost like a diary page so it’s kind of all the women who are around me, whatever books I am reading and music I am listening to. It’s always kind of the same type of person but maybe she’s growing up a little bit. Starting to grow up a bit more, I hope, like me. At the moment I’m working on my AW 14/15 and that’s going to be much more grown up again, much more sophisticated. It’s still going to have the sense of humor in it, the elements I hope to carry through each collection but I feel like the Natalie B Coleman girl is growing up. How do you see her staying fun & flirty? Women stay fun and flirty their whole lives, it’s just natural. You launched your first collection in 2011, how did you find the move from working for brands to working for yourself? Do you still find that you get to be creative or do you get distracted by running a business? I think I’ve learnt more in the last 3 years than I’ve learnt my whole previous life. It’s just been like being thrown in at a deep end. I didn’t have any business experience or any knowledge of how to run a business. All I ever worked at was design so it’s been a really big learning curve but I think I’ve been quite practical as well and not trying to do too much, not have unrealistic goals. I have put in a lot of hours but it’s been ok, it’s been an experience. It’s hard but I have a lot of secondary kind of employments; my production is in Portugal, I’ve got some really good interns that help me a lot and I have a lot of friends who work in photography, film and things which means that I can do some collaborations as well. Apart from fashion, what do you like? Food. I love food. I’m obsessed with food. I go to bed with cookery books. I love reading about food, I like eating food, so much more than the cooking, even though I like cooking but my husband cooks all the time so he’s kind of taken over the kitchen. We just eat a lot. Any favorite food spots in Monaghan or Dublin? There’s a really cool bar just outside where I had a party the next day after the wedding, it’s like an old pub / restaurant which is really nice. It’s the River Bank, it’s in the country side [Monaghan] and I love going there. They serve really good, homemade pub food and there’s an open fireplace. We travel a lot with work. I love Asian food, really fresh tastes. I eat a lot of sushi and Italian. I eat everything and everywhere! In Dublin, I haven’t been here that much recently but I think I’ll be moving back here after Christmas so I’m sure I’ll be eating out a lot more. I really like the Winding Stair on the Quays and Saba is great for Asian food. The names of your collections, they’re very unusual. Where do you get the ideas from? They mostly reflect what is going on with my life. The Sarah’s suitcase was when I was getting married so it was all very girlie, frivolous and frothy. The most recent one is called ‘I belong to me’, is that some kind of statement after you got married? Yeah, 3 months after I got married (laugh). My husband has a good sense of humour, he’s very easy going. I had a smashing party which I always wanted to do. Myself and a lot of friends got together and we had a lot of old delph from parties and different functions that were really cheap and cracked, just not really good for anything. So we had some drinks & music and we just smashed it all up. It was great, I took a lot of pictures, it was like a big release. I think I want to do another one again, a bigger one. So the idea came from this smashing party. I was looking at things breaking apart and china when it’s broken. I was looking at a lot Cubist artists as well and I started developing the prints from there, the shapes and the mood of them. It’s kind of a bit punky in its attitude. When it comes to your own wardrobe, are most of your clothes your own designs or do you ever shop on the high street? No, I don’t shop, I don’t have time to shop! I’m going to New York next week so I’m definitely going to pick up something. Each place I go to I like to get a teacup and a saucer, I collect tea sets. I spend a lot of time on shoes and bags but recently I got more into jewellery. 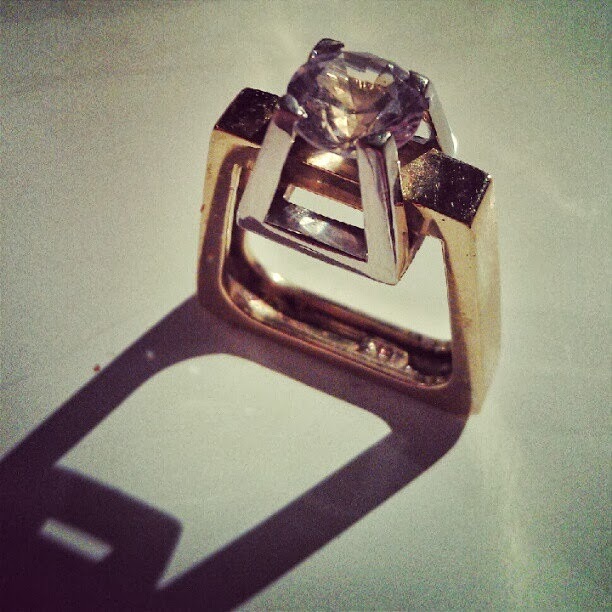 Would you consider going into jewellery design? Maybe in the future it would be nice to do a collaboration with somebody who was more gifted in that area, more of a crafts person But yes, I would like to learn a lot more about jewellery. I designed my own engagement ring and it’s beautiful, well I love it. I have a lot of vintage pieces, I love second hand stores but mostly I wear my own clothes. What social media have proven best for engaging with customers and promoting business? Twitter, it’s really good. I’ve gotten a few different magazine pieces through twitter and that time that Marina and the Diamonds contacted me, through twitter. I was wondering because I got all these new followers and then I looked back and saw a tweet from her which I wouldn’t have noticed. One of my pieces was used on a video clip for Rick Ross. It was from Spring Summer 12, the song was a number 1 in US charts, it’s called Amsterdam, the female singer in the song is Antonique Smith and she’s wearing one of my pieces in it. I didn’t know anything about it, their stylist picked it out, it’s only that somebody contacted me on Twitter. That’s people looking at the piece in a video in America, googling it, finding my name and mentioning it. It’s really interesting, it just makes the world so small. Which is great, except you can’t hide anymore. I spent my life trying to hide, not a very good career to go into for somebody who likes to be on their own a lot. I spend a lot of time on my own in studio so it’s a balance. Is there a designer that you admire most? There’s a lot of designers that I love. Historically I always loved Balenciaga, I like Vionnet because she was amazing, even for women who worked for her she brought in proper pension schemes for them, she was really female–orientated and a very strong kind of a woman. For a lot of female designers it was very difficult because it was more of a men’s world and they were very visionary so I admire all of the female designers during those periods, Chanel as well. I like Celine a lot at the moment, I like the clean lines and simplicity, it’s very clever, I love Celine, I think it’s my favorite. I like Marc Jacobs as well, I think I would really like to go out for a night with Marc Jacobs if he wasn’t in his pious state. Back in his partying days, I think that would be fun. He’s got a really good humor. There’s a lot of designers that I like, I love Danielle Romeril and what she’s doing at the moment, I think it’s great, she’s great. There’s a lot of great Irish designers, I always loved Una [Burke], she’s a good friend of mine and I love her pieces. What made you move back to Monaghan? I know you lived in London for a while. I lived in London when I was doing my MA at Central St. Martins, then I moved back to New York, back to the people I worked for before for a while. Then I came back to Dublin and I didn’t know what I was doing, it was before I set up the label and I was a little bit lost and I owed a lot of money from my Masters. I just moved back to the countryside, to my dad’s to try and figure out what to do. I love going home, it’s so peaceful, I’m a bit of a country girl so it was nice. Then I converted one of the garages into a studio and just started working there. I’m over and back between Bristol and Monaghan now, on ‘glamorous’ Ryanair flights (laugh). I think I may be moving back to Dublin in January, hopefully I’ll have a place in a centre of town which should be good. How did you manage to start your business in Monaghan? It was pure stubbornness I think because it was so difficult. I wasn’t even driving at the time, I was in the middle of nowhere, with no internet, no home phone line. I got those eventually but it was a year into it before I did. No internet, no phone line, really bad coverage, I’d be out in a ditch going ‘Can you hear me?! Now?!’. I had to go in sometimes into town and sit outside the local hotel to pick up their internet. It was crazy, in some ways it was really good because I was so cut off from everything, I just worked, I was really obsessive, I was just working all the time and I was really involved in what I was doing. It was just before everything started taking off, when I was doing my first trade shows, just before I had to focus on all of the production and make all these different changes, decisions and moves. It was a really nice time for me, I was just doing what I loved without any big stresses. How do you manage now, between Monaghan, Bristol and all the travelling? I work with these [pointing at Surface RT and Nokia Lumia]. Have you seen it yet? [the tablet]. It’s really cool. When you’re travelling, it’s so useful, it has a USB port so when you’re away and you’re going to trade shows and you take pictures you want to upload, you can do that, it’s so handy. You can plug in your phone, camera, hard drive, printer if you need something done on the go, it’s great. There’s this really great thing called OneNote; when I’m on the phone and if I’m at Premier Vision, you’re walking along and it’s just so hectic. I’d go to OneNote and I’d just speak to it for example: ‘leather at booth 103’. When you go home, you go to your OneNote on the tablet and it’d be typed up there so you can put it in your diary. They’re synchronised together (the phone and the tablet) so it just makes life a lot easier. It has a great camera on it as well. As we carried on, I learned that the model on the set for ‘Sarah’s Suitcase’ video never drove a car before. ‘Come on you’ll be grand’ Natalie said. Not surprisingly, it was better than that. I look forward to Natalie’s next move: be it new collection, move to Dublin, new story or pretty much anything; with her charm, witty sense of humor and hard work, she will surely make it work.